OK. So, this is not fancy pizza. I already said that, didn’t I? My favorite pizza is a tie between a really good Margarita (love that tomato, basil, garlic combo) or this one from The Luggage Room that has a fig paste, sharp pungent cheese sprinkles and balsamic something-or-other topped with a simple arugula salad. 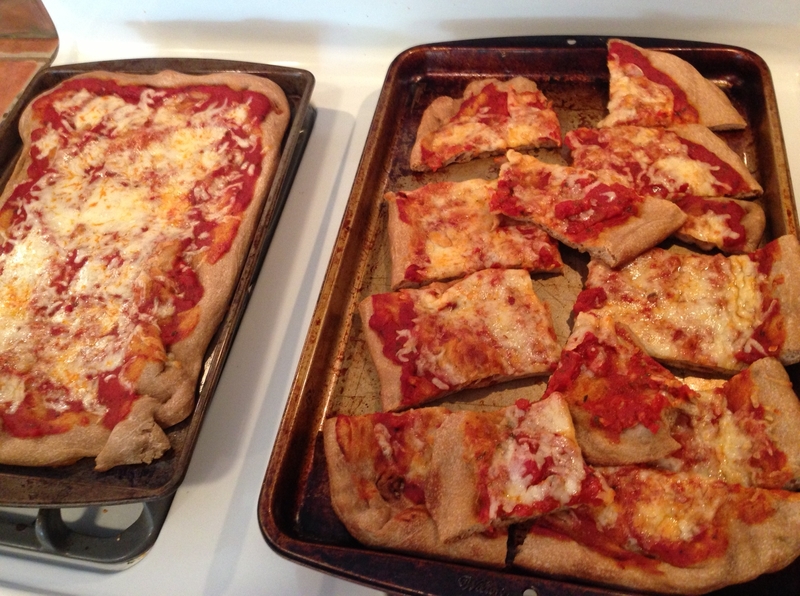 Basically it’s all three of my kids’ worst pizza nightmares tossed on a crust. So, when I make pizza for my low-brow peeps, I keep it pretty vanilla (so to speak.) Crust, sauce, cheese–sometimes sausage or pepperoni. That’s really all they desire. The reason I’m sharing this recipe with you–which is actually more like a tip–is that my not-fancy-pizza works great for school lunches, which, as our winter break has, uh, evaporated, I gotta kick things into high gear again. I make three or so pizzas at a time, cut them up into just the right sized slices to fit into my reusable lunch pouches, freeze’m and pop’m into said pouches and there you go. Who doesn’t like pizza for lunch? Well, actually Josie doesn’t, but she’s definitely in a minority here. Ingredients: Dough. Sauce. Cheese. Whatever else you want. Directions: I buy my dough (yup. It’s true) from a local Italian market. Roll it out and bake at 400 for about 8 minutes so the crust will be a bit crunchier. Then add sauce and whatever toppings. Throw back in until cheese is melted and begins to brown. Now that’s Italian.